When businesses consider ways to grow, they rarely think about customer loyalty programs. Usually, other call center services—such as sales or customer support—come up way higher on the list of priorities. However, customer loyalty is actually one of the biggest driving factors in retaining your customers and growing your business. Customer loyalty is all about creating a connection with your customers. Think about a business that you typically frequent, whether it’s a supermarket, online retailer, or bank. Or, think about a product brand that you usually buy, such as Apple or Samsung. Why do you always stick with this brand? Is it because they always have the best prices, best quality, or best deals? It could be; however, there’s also probably some connection or positive feeling that you have with the company. Customer loyalty is about creating an emotional connection or bond with a customer. People liking and becoming familiar with specific businesses is one of the biggest drivers of revenue growth. While sales and new products are often seen as the main ways to grow a business, creating connections with your customers is perhaps the key strategy used by the most successful businesses. Customer loyalty has many benefits, the most obvious being the increased business. Loyal customers are more likely to frequent your business as you become the go-to service for their needs. Plus, as they develop a stronger connection with your business, they are more likely to make larger and more costly purchases. However, customer loyalty is also the most effective way to protect your business from the competition. Loyal customers stick with your company; this means that you do not have to worry as much about losing your customers, particularly to one-time deals or new competitors. When you can create a connection with a customer, you don’t necessarily have to be the biggest company or have the best prices. Often, small businesses can compete with major corporations mostly by taking advantage of customer loyalty. As well, when mistakes or quality issues arise, loyal customers will give you the benefit of the doubt and stick with your business. Of course, if you abuse their loyalty and continuously provide poor service, they will eventually leave. However, by increasing customer loyalty, you can avoid the fallout from one-time disasters. How to Create Customer Loyalty with a Call Center? Call centers can provide customer loyalty programs that help create connections for your business. Your customer support is often the face of your business for many customers, so it’s important that customer service agents are part of your customer loyalty strategy. Here are some effective techniques for customer loyalty that call centers can use to increase business. Often, customer service training is focused on problem-solving and efficiency. While these are obviously important, it is equally important for customer service representatives to also be trained to provide pleasing, comfortable service. Your customers don’t just want their problem solved, they also want to know that they are valued and appreciated. Being courteous, thanking them for their service, and remaining honest are all just as important as solving a problem. While some call centers will have all of their agents use scripts, a more personalized approach ensures more customer loyalty. Allowing customer service representatives to follow general guidelines while also injecting their own personal touch will help create more of an emotional bond with customers. Customer service agents shouldn’t just talk at the customer or guide the entire conversation—they should also listen to what the customer is saying. Customers want to be heard, and when a business actively listens to them, they will feel more appreciated and are more likely to become loyal customers. You’d be surprised how far being positive can get you. When it comes to building customer loyalty, being positive allows the customer to feel comfortable. Once they are comfortable, the lines of communication are much clearer and customers are more open to purchasing suggestions. An experienced call center agent understands the power of positivity and the affect it has on the customer. If you’re looking for one of the most effective ways to build customer loyalty, nothing can substitute for experience. Knowing how to speak to customers, having gone through critical situations, and having the tact to adjust to new situations on the fly are all benefits of experienced call center agents. As far as tips to build customer loyalty go, technology is more important than you may realize. The point of technology is to make things easier both for you as a company, but more importantly, for your customers. Building customer loyalty with a call center that implements updated technology into its operations means your customers enjoy a better overall experience. A better experience for your customers means they are more likely to remain loyal to your brand. If there is an opportunity to give the customer more, then you need to take that opportunity. Enhancing the quality of service can mean many different things, but by partnering with a call center, you have taken an important step to improving the level of service you provide to your customers. Call centers have the skills, the experience, and the systems in place to offer your customers a more satisfactory experience. The old adage “the customer is always right” is true in the sense that their needs must be catered to above all. Even if there is a misunderstanding on the customer’s side, the onus is on you to help them understand. Call center agents make a living dealing with people. They know how to navigate conversations and deflate any situations before they escalate. Studies have shown that the less a customer has to do to resolve an issue, the greater their potential loyalty. Call center agents are trained to get to the core of the problem as quickly as possible and offer practical solutions. Customers never want to feel like their time is being wasted. Working with a call center ensures issues are handled efficiently so customers feel like something was accomplished during the interaction. What’s great about call center agents is that they understand that each customer is different. And with each phone call, they know it’s important to adjust their speech to match the temperament of the customer. For example, if a customer is someone who is straight to the point, then there’s no need to over explain anything. Just solve the problem and tell them goodbye. On the other hand, a different customer might prefer everything be explained. A good call center agent will know the difference. 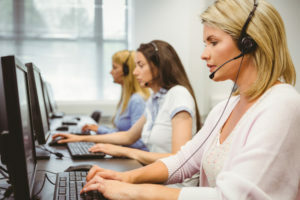 “Tip: Use Effective Call Centers to Build Customer Loyalty,” Search CRM, http://searchcrm.techtarget.com/tutorial/Tip-Use-effective-call-centers-to-build-customer-loyalty.